Thrive in the backpackers atmosphere and meet people from across the globe. 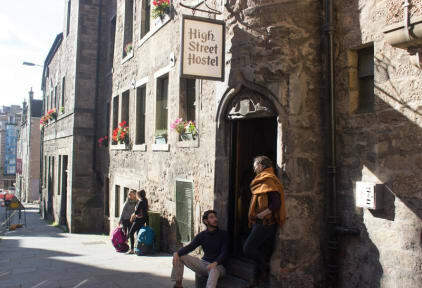 High Street Hostel operates inside a historical 470 year old building formally known as Morton House. The resident, Earl of Morton, was beheaded in 1581, a consequence of his involvement in the murder of Mary Queen of Scots’ husband. These days, we operate with less beheadings and more beddings.. hah.. However don’t be mislead. Though the hostel may be 470 years old we possess state-of-the-art facilities that will make you immediately question the present century. Welcome to the future, it comes with wifi. In conjunction with our next-generation building-wide wifi we have included personal power points next to each bed. With this combination you can maximise your time spent in bed watching films on your device instead of exploring this seemingly pre-historic city. NOTE: Do not panic. If you do not have your own device to waste time on you can always use the PC in our reception area. In regards to location, High Street Hostel is one of the most ideally situated hostels enabling travellers to step out of the door right into the heart of the city. As time goes by it seems we are becoming flanked by restaurants, pubs, and live music venues from all directions, explore the likes of which during our weekly pub crawls, trivia nights and other various events. For the night owls, we boast a 24 hour reception and lounge area to hang out before you embark on or after you wake from the sleep befit for a King of Scotland. High Street Hostel boasts the most relaxing and reverie packed atmosphere in all of Blackfriars Street, winning the Blackfriars Street hostel of the decade award 3 weeks in a row! Enjoy a daydream in the lounge with the landscape mural or question your sanity in the reception with whatever dubious music choice the receptionist at the time entertains. Whatever your fancy, the team at HSH is here to ensure a fulfilling experience of UK’s favourite city. For the frugal travellers, rest easy knowing our prices are the most competitive in the city. Not only this, but discounts are offered throughout the city to our guests for pubs to cafes to entertainment venues. If you don’t like to eat out, we maintain a fully equipped kitchen that would cause Jamie Oliver himself to quiver in fear at the thought of the storm he could cook up in it. We have tables and chairs acquired from what was the local church so you may be inspired while impressing your friends or any new friends you might make during your stay with that one elaborately delicious and spiritually enlightening meal you know how to make. Sleep well knowing you may continue your lucid mental state come morning time by avoiding the hassle of embarking into the nightmarish cold weather and taking advantage of our £1.90 buffet styled breakfast available until 10:30am. -The rumours are true, we do have a pool table. -Showers and bathrooms are located on each floor and shared between the lads and ladies. -We do not accept guests under the youthful age of 18 due to our fears of irreversible corruption as a result of interactions with our staff team. Also for legal reasons. -We do not host stag or hen parties. -You wish to stay for a prolonged period of time or any more than 14 days. -Your party/group/fellowship/bouquet of flowery friends is larger than 6 members. If you plan to have a busy day and don’t want to spend hours drying naturally, we offer towel rentals for only £0.50 and why not take advantage of our laundry service costing £4.00 and clean a whole bag of socks. For our high rolling guests, enter the world of luxury as you step into the mahogany filled reception area where you can listen to or endeavour to play the smooth sounds of the piano while smoking your pipe on the antiquated rich leather couches we acquired from private sales across the globe. Disclaimer; we do not allow smoking inside the hostel under any circumstances. We do however invite you to pursue future diseases and lung problems by taking advantage of our smoking area conveniently placed outside, and accessible from, the lounge. Great all round. Really lovely hostel with a good atmosphere and the location is so central. All the little extras were great, breakfast, the decor, the large lockers. Would stay here again. Amazing hostel. I felt very comfortable here like a home away from home, and met some great people. Top notch. This hostel is located in the heart of Edinburgh, just a few steps away from High Street (as the name suggests). The staff are very friendly, the facilities are good, and even the other guests were very considerate in terms of being quiet and keeping their belongings to their own space. I felt safe the whole time I was here, and the price was very reasonable! If you're traveling alone or in a small group, this is an excellent place to stay on a budget! Great hostel just off the royal mile. Public transport is easy from the airport to the hostel. Easy to get to major attentions and good. Cleanly with respectful staff. Towels for hire and basic breakfast for £2. Would stay again. All around a really great hostel!